Loved this book!! 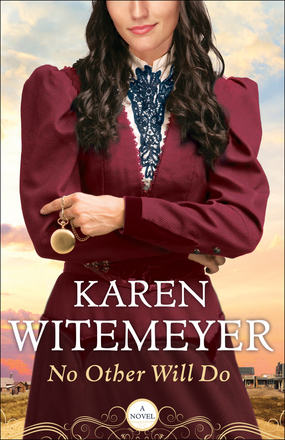 Karen Witemeyer remains one of my favorite authors to read. The sense of humor incorporated in her books along with the spiritual just makes the book so worth the read. Emma is the leader of a women's colony and very well respected. The women who live there have been abused, and used up by men and are ready to show the world they have stamina and can survive on their own! But a threat develops, and now the women are in danger. Emma feels a deep sense of responsibility as she tries to figure out what to do. In the end, she decides only One man will do. One she knows she can trust! Malachi, a long time friend, who still considers her his angel. A man who has earned the respect he gets, but because he knows what its like to be down and out, has built up a wall not many can cross over. As the bullets fly so do the feelings and emotional charge in the air every time they get close to each other. Will either of them let their guard down enough to let love grow? Or are they so set in their independent ways that they will still end up apart? This book is full of twists and excitement. Not only is it emotionally charged with sparks flying, but it is also spiritually charges as both Emma and Malachi seek God's will for their lives and the lives of the ladies in their care. They are selfless and sacrificing people, hard working, determined and willing to do what it takes to take care of those they love. You won't go wrong with this one! I received this book from Bethany House in exchange for my honest opinion.